A THIRD-generation Kenyan, Kiran Jethwaa��s mixed heritagea��English from his mother and Indian from his fathera�� reflects in his style of cooking. 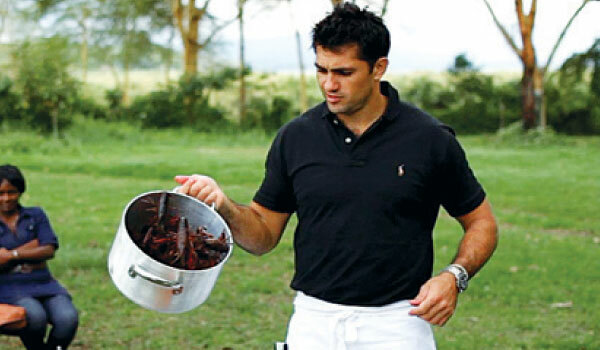 The chef and owner of Nairobia��s premier seafood restaurant, Seven Seafood & Grill, he was a finalist for The Taste Awarda��s a�?Chef of the Yeara�?.A� As Kenyaa��s first celebrity chef , thanks to his show Tales From The Bush Larder, the international rugby player says his three-series show takes you into the interiors of Africa. a�?Me and my business partner wanted to bring out a different yet positive thing from Africa. Otherwise it is always disease, poverty and negativity. The idea is to show the brighter side of African food,a�? he says. Crediting the ingenuity of the people who cleverly use what little they have as his inspiration, Jethwa really hopes to open up the continent as a culinary hotspot. a�?With the ingredients and processa��like fishermen catching prawns with hand netsa��the whole idea is to take people to the roots of Africa.a�? Calling it a food and anthropological travelogue with plenty of adventure thrown in, Jethwa explains that the process of cooking and collecting ingredients changes in the interiors because they cannot afford to waste anything. a�?For example, the way they catch lobster. They get a long stick and put an octopus at the end of it because lobsters are terrified of them. They lower the stick, push the lobster out of its hiding place, and catch it when its cornered,a�? shares the chef. While it looks glamorous on television, Jethwa assures us that it is far from the truth. a�?For sure the most challenging part of the show was the harvesting of all the various ingredients. Ita��s often back breaking and dangerous work. It gives you a real respect for all the farmers, fishermen and hunters whom we met,a�? he says, signing off with a promise of the next two parts (all in interior Africa) airing soon.